Boxing Day 06, originally uploaded by Lukasmummy. 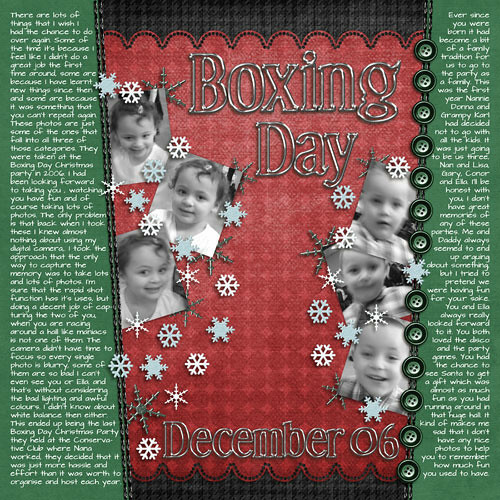 Credits: Layered template (Drifting, Template A) by Gabriella Hägglund (Ella Designs), Merry Christmas and 10×10 Scallop Page Mats by Laura White (C.W Picket & Company and Stunningly Silver Alpha by Jane Shaver (Little Red Scraps). Font is Architects Daughter by Kimberly Geswein. Journalling reads: There are lots of things that I wish I had the chance to do over again. Some of the time it’s because I feel like I didn’t do a great job the first time around, some are because I have learnt new things since then and some are because it was something that you can’t repeat again. These photos are just some of the ones that fall into all three of those categories. They were taken at the Boxing Day Christmas party in 2006. I had been looking forward to taking you, watching you have fun and of course taking lots of photos. The only problem is that back when I took these I knew almost nothing about using my digital camera. I took the approach that the only way to capture the memory was to take lots and lots of photos. I’m sure that the rapid shot function has it’s uses, but doing a decent job of capturing the two of you, when you are racing around a hall like maniacs is not one of them. The camera didn’t have time to focus so every single photo is blurry, some of them are so bad I can’t even see you or Ella. and that’s without considering the bad lighting and awful colours. I didn’t know about white balance then either. This ended up being the last Boxing Day Christmas Party they held at the Conservative Club where Nana worked, they decided that it was just more hassle and effort than it was worth to organise and host each year. Ever since you were born it had become a bit of a family tradition for us to go to the party as a family. This was the first year Nannie Donna and Grampy Karl had decided not to go with all the kids. It was just going to be us three, Nan and Lisa, Gary, Conor and Ella. I’ll be honest with you, I don’t have great memories of any of these parties. Me and Daddy always seemed to end up arguing about something, but I tried to pretend we were having fun for you.r sake. You and Ella always really looked forward to it. You both loved the disco and the party games. You had the chance to see Santa to get a gift which was almost as much fun as you had running around in that huge hall. It kind of makes me sad that I don’t have any nice photos to help you to remember how much fun you used to have. 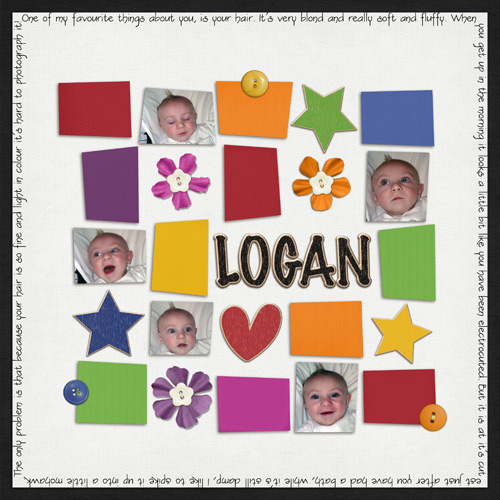 Logan’s Mohawk, originally uploaded by Lukasmummy. Credits: Layered template (Wonky Grid Template) by Melody Valentine and Everyday Moments, Everyday Moments Cardstock and Everyday Moments The Neutrals all by Jane Shaver (Little Red Scraps). Font is DJB Constance Beauregarde by Darcy Baldwin. Happy 5th Birthday, originally uploaded by Lukasmummy. Credits: Layered template (Water Getaway Template 1) by Mandymade Designs and Everyday Moments and Everyday Moments Cardstock by Jane Shaver (Little Red Scraps). Font is Ghostwriter. 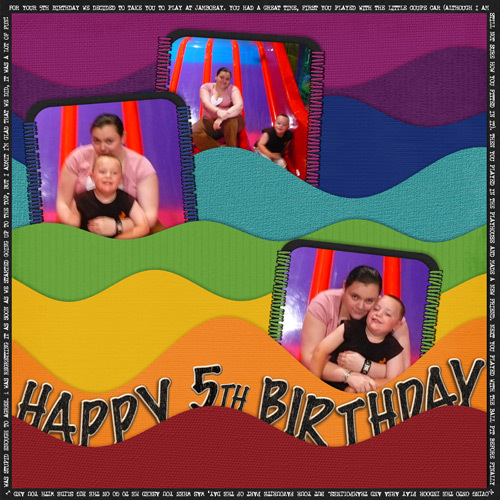 Journalling reads: For your 5th Birthday we decided to take you to play at Jamboray. You had a great time, first you played with the little coupe car (although I am still not sure how you fitted in it). Then you played in the playhouse and made a new friend. Next you played with the ball pit before finally moving onto the indoor play area and trampolines. But your favourite part of the day, was when you asked me to go on the big slide with you and I was stupid enough to agree. I was regretting it as soon as we started going up to the top but I admit that I am glad that we did, it was a lot of fun!